Introducing the Basket of Flowers block, from issue 14 ‘Art of Quilting’. And what a little trickster this was! Just when you get the hang of ‘chaining’ and running seams from top to bottom, this little bunch of pieces involved set-in seams, meaning the seams meet at the same point rather than the lines of stitching crossing over. Though my quarter inch foot is still my best friend when it comes to quilting, in this instance it is also advisable to draw on the seam lines so you can accurately pin point where the seams will meet. The red flower diamond shape and the orange daisy diamond shape are seamed together, starting and ending at the seam points. This is repeated for the second set. The small white triangles are then positioned between the diamond pairs, and each side sewn from edge to seam point. These two sets are then joined along the long edges of the diamonds from seam point to edge. The white square then is inserted between the two sets, being careful to meet at the seam points. Then it starts to get a little easier as the big green paisley triangle is sewn along the long edge. No seam points to meet just edge to edge seam. The little green paisley triangles are then seamed to the white rectangles and seamed to each side. 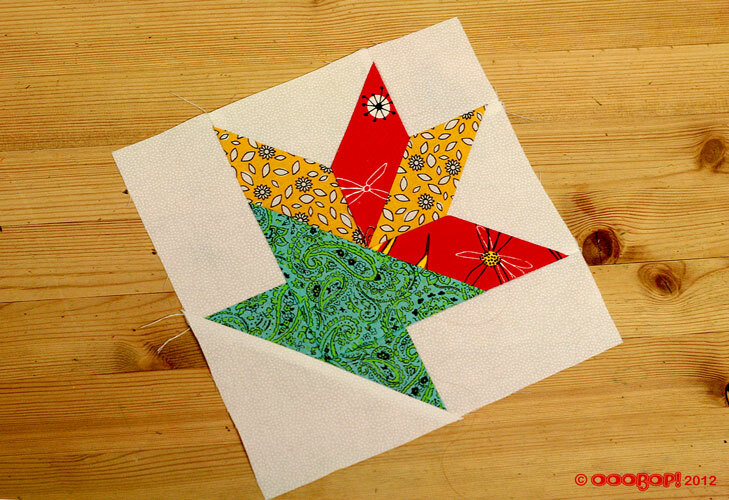 One last big white triangle to sew across the bottom… a good old press … et voilà! This one did take a little more time than the others but it was still a pleasure to make and its a lovely one to add to the set. They are looking lovely together, I have to say. But its a long way off! The fabrics do come with the patterns and I was half expecting to have to substitute my own occasionally but actually I like all the choices that have been presented! Are all these different blocks going to be made into a single quilt? Am enjoying watching this process! Indeed… in a very far away point in time! I have to make 80 of them and I’m not even a quarter of the way there! But am enjoying slotting them in between longer projects. Previous PostPrevious Blue suede shoes… and no silly walks! Next PostNext Jubilations and hangovers!